After Jason reviewed Dawnguard on 360 and didn't really care for it, I lost some of my enthusiasm. "Basically, it's more Skyrim," seemed to be the consensus. I decided that rather than burn through Dawnguard, I'd approach it at a more leisurely pace, thinking of it mostly as a way to get back into Skyrim. I've installed some new mods and some other small and large tweaks, and as a result, Skyrim feels like a fresh experience. Dawnguard gives me just the excuse I need to revisit it. Here are some tricks that'll help give Skyrim a new life on the PC, just in time for Dawnguard. Skyrim has been way too easy for me for a while now. I bet it's too easy for you, too. I laugh in the face of bandit enclaves, walk right up to cave bears without blinking, and only rarely feel a challenge from all but the most ancient Dragons. When I started playing Dawnguard, I decided that needed to change. So, I ratcheted the difficulty up to "Expert," then to "Master." Now I take twice as much damage as I used to, and do half as much, and the game is much more interesting. It's still not usually all that hard, especially given that I roll with a really smart healer these days (more on that below), but it's a lot more engaging than it used to be. Some of these early battles with Vampires have been dicy! Just after I posted this article, modder Eric Williamson emailed to point me to this mod he made that makes Skyrim even harder on higher levels. I haven't tried it yet, but I'll give it a run tonight. It certainly sounds cool! This may seem like heresy coming from Mr. Kotaku Melodic Man, but these days, I've been playing Skyrim with the music turned all the way down. It's nothing against the work of Jeremy Soule; after all the Skyrim soundtrack was one of my favorite soundtracks of last yea. But as I've written before, sometimes games are better with no music at all. I've heard each of the tunes in Skyrim so many times that they no longer have any effect on me at all—if anything, they case me to lapse into a sort of "Skyrim Stupor." When I turn the music off, I hear a different kind of music. Particularly with the "Sounds of Skyrim" mods installed, the wilderness and dungeons have a new life. That said, some of the new areas in Dawnguard do have their own new music; that's certainly worth listening to, so this tip mostly applies to when your travels take you across Skyrim proper. I'm still running all of the mods that I posted back when I ran that feature detailing the many beautifying mods I use. Since then, I've also added a few more to the mix. With all of them running, they serve to make Skyrim a much more interesting, varied and good-looking place to be, which in turn enhances Dawnguard. Go back to that article and follow the instructions to get the Nexus Mod Manager up and running, and go ahead and install the most current versions of all the mods on that page. This is an upgrade on the Flora Overhaul I'd been using; it's better than ever, and raises the resolution on all of the new textures. It slows things down a bit for me framerate-wise, but just a bit, and the wilderness of Skyrim looks much better for it. This one's been a long time coming; I was resistant to this mod for a while since I didn't like how the hair looked, but now that I've installed it, I'm glad I did. It adds a great variety of different looks to the game, and combines with Dawnguard's new face-surgeon to let you pick out any of the hot 'dos for your Dovahkiin. I've never been one for AI companions in Skyrim, they tend to hinder more than they help. The lovely Cerwiden has proved to be the exception. She's a powerful mage who can be programmed to do all manner of different support roles, meaning that she no longer gets in the way when I'm trying to be stealthy. In fact, I have her set to never attack and to act only as a healer, which is needed a lot more often now that I've bumped up the difficulty. A sizable overhaul to the appearance of various types of armor in the game; this, combined with Cloaks of Skyrim, makes the game look much more lived-in and interesting. A whole mess 'o swords for the game. I'm kind of sick of my all-killing Daedric sword, so: Cool. If you've been playing Skyrim enough to be an early Dawnguard buyer, chances are you're sick of the lore that displays on the game's loading screens. This mod adds a ton more variety to those, sprinkling lore from around the land of Tamriel and (I believe) re-using loading screen lore from past games. This mod has gone the farthest towards making the game feel and look very different. The new weather effects are striking, and serve to make the whole game darker, moodier, and more realistic-looking. This is particularly true in dungeons, where you'll of course be spending a lot of time during Dawnguard. I'd been hesitant about drastic realistic lighting overhauls in the past, but this one is so good that I'm very glad to have installed it. A few other mods you could try that I don't use: The Monster mod ads a frick-ton of new monsters to the game; it's too drastic for my taste, but if you really want the game to feel different, do it. Some of the monster designs are super cool. For Dawnguard, the Better Vampires mod sounds like an intriguing bet, but I'm curious to see how the actual vampires in the add-on play, so I don't want to change too much until I've played some. If I ever play Dawnguard again and opt to become a Vampire Lord, I'll certainly give that mod a go. I know, I know. When I previewed Dawnguard, all I could talk about was how cool the vampire lord looked. And while I do think it's cool to turn into a cloud of bats and raise the dead, I'm actually glad that I've started down the path of the Dawnguard. It integrates more cleanly with my character, and doesn't make me transform into a creature that locks out all the sweet gear I've crafted during my time playing the game. In other words, I'm happy to be a guardian of justice and light, and I hear that the Dawnguard questline is pretty good, as well. This one's optional, of course - I'm having a fine time with Dawnguard playing as my high-level "main" character. But after I'd played a bit of the Dawnguard quest, it felt a little bit weird that my character, the all-powerful Dovahkiin who had united the land under Ulfric Stormcloak, defeated dozens of dragons, and lost his sweetroll scores of times, wasn't being recognized by the Dawnguard soldiers. It'd make a lot more sense to play this story as a new character, and what's more, the questline would be cool to have folded in with the other faction quests during the game—as it stands, it's one of the only meaty quests I've got going. This one's going to be a tough sell for anyone who's played a ton of Skyrim. If you're like me, you probably avoided fast-travel for the first couple dozen hours playing the game, then finally decided that life is too short. But life isn't too short! Life is about the journey, not the destination, and I found that when I made myself stop fast-traveling, I rediscovered the joy of wandering Skyrim. Particularly with all my hot new mods in place and the higher difficulty, wandering the land is a great way to re-experience the game. Yes, there's an impulse to devour all of Dawnguard's new content as quickly as possible. But I think that'd be a mistake. It must be said that even in its early goings, Dawnguard does seem kind of like thin compared to some of the other quests—it really is just "more Skyrim." But the way I've been playing—the mods, the higher difficulty, the re-discovered sense of the land… that is what I'm playing for, and the Dawnguard questline is just giving me a framework upon which to hang it. I've come to terms with the fact that I'll never re-create those giddy first hours in Skyrim, when I wandered gobsmacked through the world, hitting F12 like a first-time tourist in Paris, unable to believe just how grand it all was. 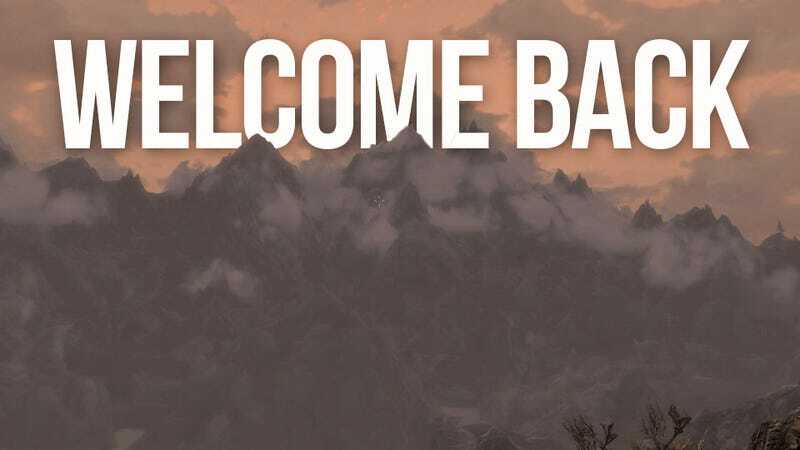 It may take a more substantial add-on than Dawnguard to bring me close to that feeling again, but after taking the steps listed here, Dawnguard has already given me a chance to return to one of my favorite games anew. With some creative tweaks and judicious application of the excellent products released by Skyrim's amazing modding community, Dawnguard has more than enough juice to let PC gamers discover Skyrim all over again.